You want security for your family and you need a front door. Combine the two with a Signature Iron Door. You get peace knowing you’ve provided the best for your family and pleasure from providing a beautiful place your family calls home. Signature Iron Doors has found the answer to how to provide safety, beauty, and comfort. 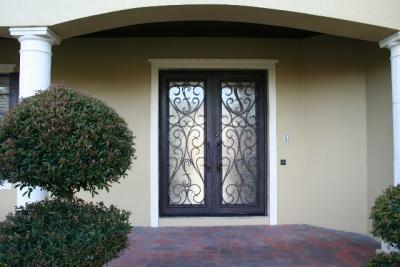 We installed this iron door in Paradise Valley Arizona. Your high ceiling is complemented with a stunning transom on top of your hand forged iron double door. Striking glass lies behind intricate scroll work that you can easily open to let air in on those cool spring days and wipe down after those summer monsoons. With this textured rain glass, you welcome a comfortable amount of natural light while maintaining your family’s privacy. When locked, your key is the only thing that will get through the dual panned glass and 14 gauge steel. Call us and come visit our showroom in Phoenix Arizona to meet with a sales representative and find out your iron door possibilities.